I love Minion and have used it for years. Today when I clicked update next to a single addon, the progress bar filled up but never went away. I waited but it didn't change. So I restarted Minion, and this time the addon was no longer showing as installed. Odd but I go and find it again and press install, same thing. 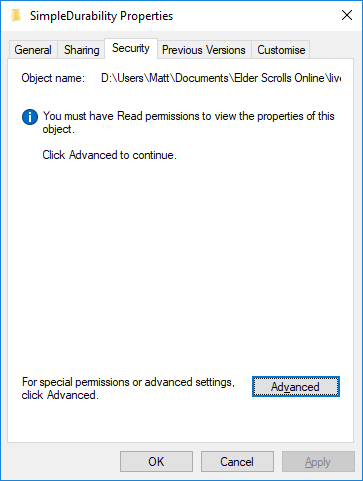 I checked the minion log and the new install talks about "Couldn't create dir/file"
I then checked the addons folder and the addon was in there, except all the permission have changed on the folder so now I have zero permissions to it. I cant do anything with folder. Why does Minion change permissions on a folder? And how can I get control of my own folder again? This looks more like the work of antivirus software interfering with minion. I've seen similar cases before, where an antivirus would block removing a file during update, which then became inaccessible and could not be deleted by hand. After restarting the file was gone. 15 minutes ish later the folder deleted itself, so odd. Heard of Bitdefender Antivirus being one reason e.g. but was not using it so far. Did not know windows defender is a blocker as well.